"Chance only favours the prepared mind." This famous statement by Pasteur applies perfectly to the historical discovery by Alphonse Laveran of the agents responsible of malaria. This discovery was exemplary in the simplicity of the means used and by the fact that Laveran's work went against all the theories then accepted by the greatest scholars of the time. Born into a family of officers and military doctors, Laveran spent several years of his youth in Algeria, before coming to Paris to finish high school, attend medical school and complete his training as a military doctor at the Val de Grâce School. Appointed assistant medical surgeon-major and Associate Professor at the Val de Grâce, at age 29, he continued nevertheless to regularly attend laboratories at the Institut Pasteur, but also the anatomo-pathology laboratory of Achille Kelsch at the Val de Grâce and that of Antoine Ranvier, former assistant of Claude Bernard, at the Collège de France. This training as a cytologist will later play a crucial role in his discovery. Appointed Surgeon-Major, he was sent to eastern Algeria (Bône and Constantine). At the time, malaria was a scourge in Algeria, despite "quininization" campaigns, following the work of Maillot. The causative agent of malaria was still unknown then. In the wake of the pasteurian revolution, and after the failure of the theory of spontaneous generation, there were various suggestions to implicate bacteria, such as Bacteridium brunneum and Bacillus malaria, or even algae and fungi, followed by vain attempts to isolate them from the air, water and soil of swamps. Going against the prevailing scientific dogma, defended by the most prestigious scholars of the time, Laveran decided to seek the explanation in the blood of patients. Equipped with only a cheap microscope and after long hours of observation of (unstained) blood of malaria patients, he noticed melaniferous leukocytes and a generalized "melanaemia" as well as the presence of spherical bodies, some of which pigmented, with amoeboid movement. Early in the morning of November 6th, 1880, while examining the blood of a patient, without any staining and using a x40 objective, he saw for the first time a number of filiform elements, flagellum-like, which moved with great vivacity around a pigmented, spherical body. He does not exult, he does not write poetry, as Ronald Ross will do later when he saw his first oocyst in the midgut wall of a mosquito, but he knows he has won and that he had been right against all odds. Chance had also served him: what he had observed was exflagellation, that is to say, the transformation of a male gametocyte into microgametes, a transformation that normally occurs in the mosquito’s stomach and not in the blood of a patient. 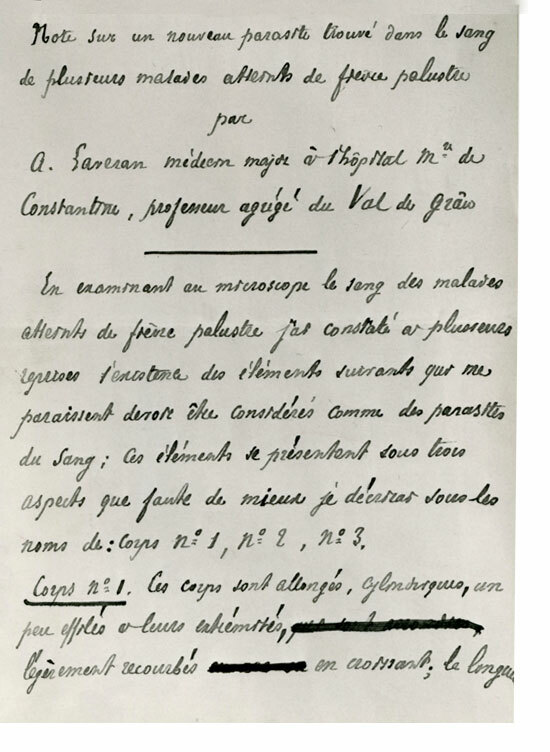 Seventeen days after the discovery (on November 23rd, 1880), Laveran sent a note describing his discovery to the National Academy of Medicine of France. Initially, his discovery was disputed, until the biggest names in malariology, especially those of the Italian schools of Marchiafava, Bastianelli, Celli, Mariotti, confirm it either using microscopic observations or by infecting mosquitoes with the blood of malaria patients. Initially, Pasteur himself was not convinced. Roux arranged for Laveran to come to the laboratory of the Val de Grâce, in order to examine some of his preparations. Pasteur marvelled at seeing an exflagellation and, from then on, gave Laveran his full backing and scientific support. Laveran left the army in 1896 and joined the Institut Pasteur where he shared a modest laboratory with Félix Mesnil. In 1907, his discovery earned him the fifth Nobel Prize in Medicine. He donated half of the award to the Institut Pasteur for the creation and equipment of a laboratory best suited for research on protozoa and, in particular, the study of trypanosomes of which he became a world specialist. Another donation enabled the creation in 1908 of the Société de Pathologie Exotique, of which he was the first President. 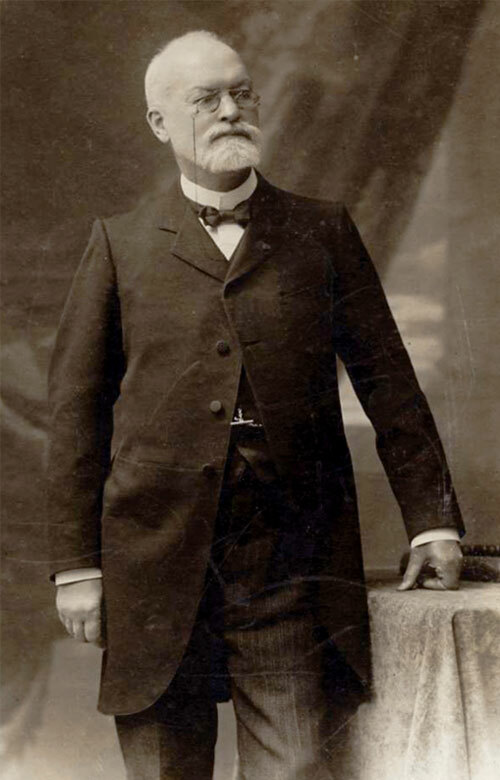 Laveran was a member of the National Academy of Medicine of France, which he chaired in 1920, the Institute of France (Academy of Sciences) and a large number of French and foreign scientific societies, including the Royal Society of Tropical Medicine and Hygiene. His work includes more than 600 scientific publications, including his famous book, the ‘Traité du Paludisme’, published in Paris in 1898. Bruce-Chwatt, L.J., 1981. A Laveran’s discovery 100 years ago and to day global fight against malaria. Journal of the Royal Society of Medicine, 74: 531-536. Laveran, A., 1880-1882. Sur un nouveau parasite trouvé dans le sang des malades atteints de fièvre palustre. Memoires de la Société Médicale des Hôpitaux de Paris, 17: 158-164 and 19: 168-176. Laveran, A., 1881. De la nature parasitaire des accidents de l’impaludisme. Comptes Rendus de l'Académie de Sciences, 93: 627-630. 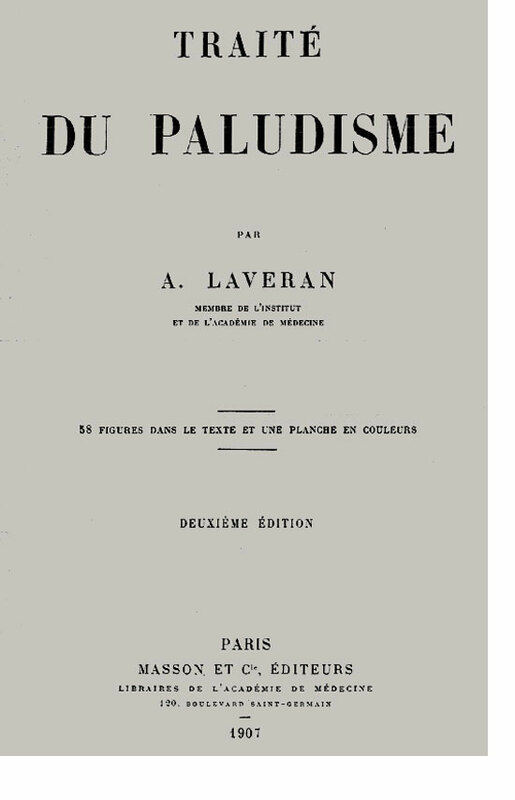 Laveran, A., 1884. Traité des fièvres palustres avec la description des microbes du paludisme. Doin édit., Paris. Laveran, A., 1898. Traité du Paludisme. Masson édit., Paris.